You run a business, and of course you want to attract more clients. Feeling overwhelmed? Let’s make life easier on you. Click the image above to get the free Action Guide so you can de-stress and start getting results! Wouldn’t it be awesome if you could cut your marketing activities in half, and get twice as many clients or more? What if marketing could be simple and fun? Impossible? Well no, not really. As it is, for most business owners marketing is frustrating. Plus every day you find a gazillion new strategies to follow. The worst thing is when you try to do it all – Facebook ads, speaking, blogging, networking, webinars, podcasting, etc. – and none of them produce the results you want. The post below is really awesome, but also really long. If you don’t have time to read it, I’ve put together a quick Action Guide that shows you how to use this strategy. It’s free and you can get it when you click this link. I totally get this… I’ve been there too. I’ve found a solution that I’m going to share it with you. You should know though, I paid a steep price for it – the price of my health. I have a solid business today, on target to earn multiple six figures, but it wasn’t always like this. In fact, the first two years totally sucked. I was working to the point of exhaustion, always wondering where my next client would come from. And… I got sick. I no longer had a choice – I had to stop working all those hours. But I also had to feed myself. Getting sick forced me to figure out how to stop being so scattered. This is when I discovered a system to market less and attract more clients. A 5-step system to create a your marketing plan that will allow you to market less and get more clients. The most common marketing traps and how to avoid them. How to leverage your marketing strategies, so your results are multiplied over and over. Let’s think about this… in a medical emergency, one of the first things the doctor will do is get control of the bleeding. Until the bleeding is under control, other treatments won’t do much good. Similarly, to stop overwhelm in business, we have to get control of the bleeding: the bleeding of your time and energy. If you were to discover the most brilliant strategy today, but you’re totally exhausted and overwhelmed, it’s not going to do you any good. One big marketing trap: trying to do it all. Facebook ads, blogging, networking, speaking… and on. We may feel worse when we observe others who seem like they’re doing everything without any problem. It makes us think that we that we have to try to do it all. And even worse, we try to do it all ourselves. You see an expert promoting a marketing strategy that promises a compelling result – something you really want. Then once you get into the strategy, you realize there is a huge learning curve to mastering this new skill, and frustration sets in. It happens, and you don’t even notice it while it’s happening. It starts with one opt-in, then another, and another. And before you know it, you’re getting 20+ emails a day, each one pulling you in a different direction. Each one sucking your time, talking you into a new marketing tactic and taking you down another rabbit hole. Not to mention that if you try to implement all these things, they take an enormous amount of time, effort and energy. And before you’ve finished implementing any of them… BING! Another 15 emails have arrived, with strategies that look way more attractive than the frustrating learning curve you’re currently in, so you jump ship and move on to something new. You consider unsubscribing… but how do you know which strategies to abandon, and which to keep? By the end of Step 2, you’ll know exactly what to unsubscribe from and I’ll give you a tool that will help you do it in 2 minutes or less. Remember, like in a medical emergency, we’re going to start by controlling the bleeding first. For most people that list is at least 10 items long. And the problem is that if you are a solo professional or a very small company, and if you are focusing on more than 4 of those activities, chances are you’re not doing them well. If you’re focusing on more than 6, you’re probably totally overwhelmed. If you’re focusing on 6, and trying to learn 6 more… you’ll just go completely nuts. So now, take a deep breath. Getting this list out of your head and onto paper is the first step to taking your energy back from being so scattered and worried. At least we’ve found out what’s going on and what overwhelms you. Following along with the Action Guide will help you get your plan into action faster. Click here to get it now – free. Now you’re going to further focus in the marketing activities that will bring you clients. Great clients. In the second column, write down the names of your top 10 clients. 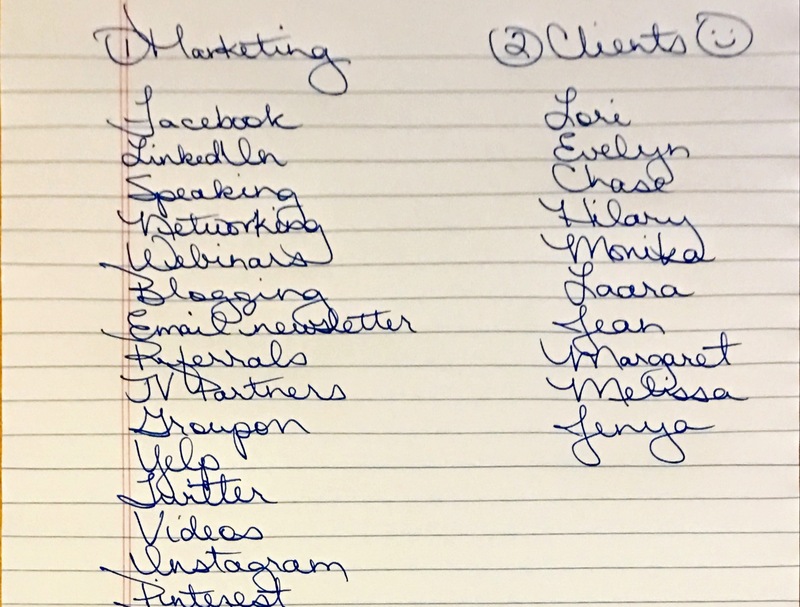 Only write down the names of clients who are great examples of your ideal client. They are the ones who are easy to work with, appreciate your expertise, and pay you on time without haggling. It’s important to NOT include any client who makes you cringe or gives you a sinking feeling in your stomach. This personalized plan is going to help you multiply your results many times over, so make sure you’re multiplying the right clients! Now, consider where each client came from. Draw a line from each client to the marketing effort that brought them to you. This will quickly reveal the top marketing strategies you should focus on. Based on my example image, where do you think I should be putting 50-80% of my time? So, speaking is my most effective strategy. Referrals also brought in several clients, so that will get attention as well. Both of those strategies are working, so it makes sense to focus on doing more of them, right? List which activities you identified that work best for you. Which marketing activities do you enjoy doing? 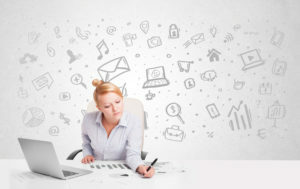 Which marketing activities do you know how to do skillfully? Which marketing activities do you have the highest degree of confidence will work? The marketing activities that meet all 3 criteria above are the ones that will go on your marketing plan. One last thing… remember in step one, all those emails that are coming in and pulling you off track? 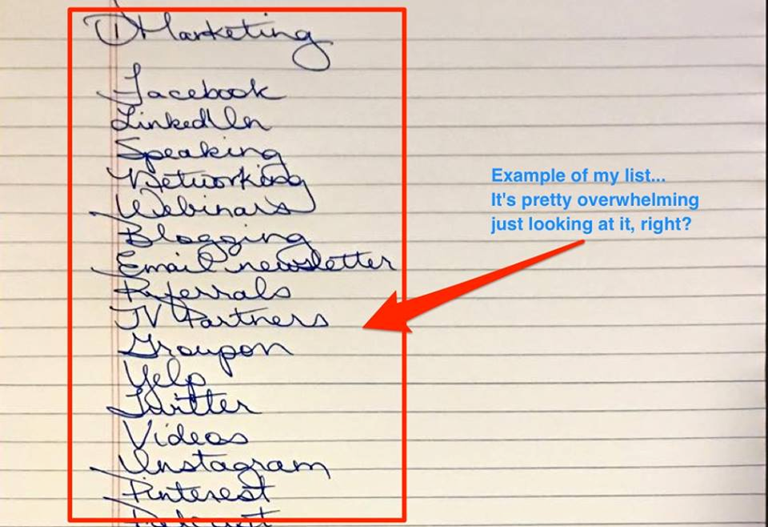 The list you just created of your top marketing strategies will also show you which lists to stay subscribed to and which ones to ditch. Stay on the lists that support and align with your top strategies, and unsubscribe from the rest. 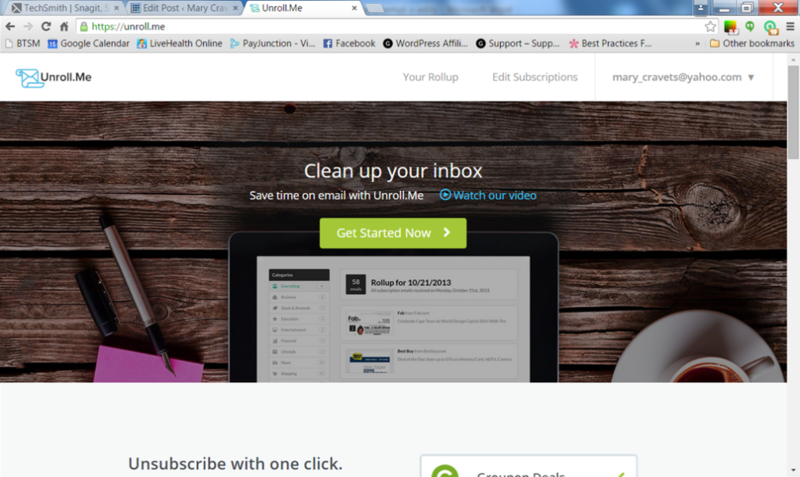 A great free tool to do this is www.unroll.me. You go to one site, enter your email address and password and it detects all of your subscriptions. In about 2 minutes you can unsubscribe from everything that is pulling you off course! Now you’re going take the top-performing marketing strategies that you identified in the previous step, and get crystal clear about the exact actions you need to take. Your personalized marketing plan will consist of just 2-4 marketing activities, and how many of them you are going to do each day, week or month. This is an absolutely critical step that can massively change your results. I’ll give you a real-life example of the difference this makes. I struggled for years to get speaking gigs. Every month I put on my plan, “Book speaking gigs.” And every month, I booked exactly zero. It was because I put a strategy on my list, NOT an activity. Once I realized this, I changed my plan to “Make 15 speaking inquiries per month”. And immediately started booking gigs. When you list strategies or results instead of actions, you are setting yourself up to fail, because they are dependent on some outside force (like a group’s organizer saying “yes” to book me). Your plan must outline exactly what you need to do in terms of what you have 100% control over. How many are you doing now? What results are you currently getting? 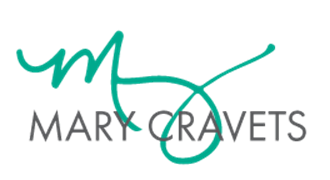 Let’s say you currently do 5 speaking inquiries per month, and you book 1 speaking gig each month. Your goal is to increase your results to booking 4 speaking gigs per month. You would want to do 20 speaking inquiries each month. If you don’t have the exact numbers of how much marketing activity you’ve done in the past, then take your best guess. Go on to the next step and you’ll see how to quickly turn your best guesses into great results. At this point you have a customized plan that is really tight, clear, and ready to implement. From an outside perspective, it’s easy to see the error in the thinking here, but the reality is that this happens all the time in the life of an entrepreneur. First, set appointments on your calendar to do your marketing, and have a “no matter what” attitude about using this time get your marketing done. Turn off your email during this time, and your phone if at all possible, and don’t reschedule the time! 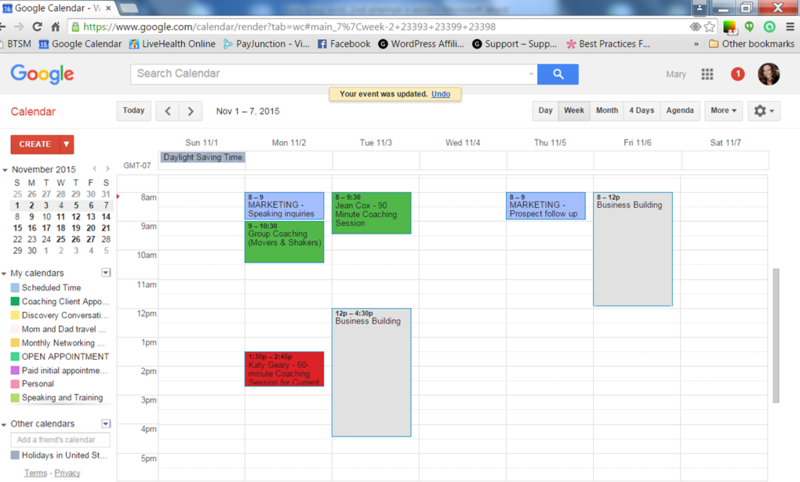 Good to note: To get a jump start on my marketing plan, I always book more time in my calendar for business building activities on the first week of the month. The calendar image is an example of how I block my time on the first week of the month only. The rest of the month I only need to do about 1 hour of activity per week. Second, track your progress. Tracking is a motivator, because it shows you what you’ve accomplished. Plus, it shows you what is still left to do, so you can schedule accordingly. And from your tracking, you can develop a very accurate formula for how to get all of the clients and income you want. So what should you track? At the most basic level, you want to track activities and results. Activities. These come directly from your marketing plan you created in steps 1-3. Keep a tally throughout the month so you aren’t trying to remember or recreate your numbers at the end of the month. When in doubt, track a little more than you think is necessary. It’s better to have the option to dismiss some data as irrelevant than it is to wish you had more data. For those of you who did the first steps and got a clear direction for your marketing based on past successes, tracking keeps you on track with actually implementing your marketing plan and growing your results. For those of you who had to make your “best guess” for your marketing plan, tracking is just as important. Over time, tracking will give you a crystal clear path to follow because it shows you exactly what works and what doesn’t. It’s easy to confuse being busy with being profitable. Or being well-known with being profitable. But that’s the great thing about tracking and numbers: they are unemotional. They tell you the truth. They will clearly tell you if you’re on the right track, or need to change something. After just a few months, you’ll have a formula that will let you know exactly how to plug a certain number of activities into your calendar, and have a predictable number of clients each month. For instance, let’s take the plan I developed earlier in this blog where the marketing plan is to simply do 15 speaking inquiries and 30 referral asks per month. Let’s say I implement the plan for 3 months and (because I’m tracking my results) I know I’m booking 3 gigs per month, receiving 2 referrals per month and earning on average $8,000 per month. If I want to double my results, I can simply double my activity levels. Triple my results? Triple the activity. Creating a formula to accurately predict and control your results is pretty great, but I bet you looked at the suggestion to double or triple your activity and realized that, at some point, you’re going to run out of time. You’re right. That’s why there is one more step to further multiply your results with less effort. To multiply your results, every activity you do needs to be systematized and connected with your other marketing activities. And when this is in place, the results from your efforts will skyrocket. Multiplier #1: Systematize the booking process. Multiplier #2: Leverage speaking events to create multiple business-building outcomes. Book more speaking gigs. The presentation include an opportunity for the participants to give referrals to other groups who need guest speakers. Build list. The presentation structure also ensures I get every contact in the room, every time. After the gig, I have systemized follow up so no contacts ever fall through the cracks. Generate leads. Even in groups where they don’t allow an overt sales offer, the presentation structure I follow generates leads from every audience. And again, the follow up system is in place so no leads are lost. Multiplier #3: Leverage other marketing channels to generate future clients. The contacts generated from speaking gigs aren’t always ready to buy right away, so I nurture them by including them in my e-newsletter list where they receive sales offers and valuable content. The content comes from my blog, so now the blog content is doing two jobs – 1. It keeps my website alive and gets some organic search engine love and attention, and 2. Serves to build long-term relationships with the contacts I get from speaking. This system takes very little time to implement, and smoothly integrates and leverages several marketing strategies. How can I systematize this so it takes less of my time? How can I make connections between my marketing strategies so they leverage each other and multiply my results? Now that you’ve got this great new tool, it may feel a little strange and unfamiliar, and it will probably take a little bit of practice. If right now you are in massive overwhelm and following a gazillion different strategies, it may take you anywhere from a few days to a few weeks to untangle yourself from some of those activities. But don’t worry. At least now you have a plan to follow. This gives you a way to laser focus on just the 2-4 marketing activities that actually work. Making these changes may be uncomfortable, but you have a choice: you can either continue with your overwhelm by chasing after whatever strategy your email spits out today, or you can do what successful entrepreneurs do… they focus, identify what’s working, and then follow it religiously. To get started right away, download my Personalized Marketing Plan Action Guide to help you implement the 5 steps right now. Great post, right? Theres a lot more where that came from. Click here to get my next post delivered to your inbox. Thanks Mary. 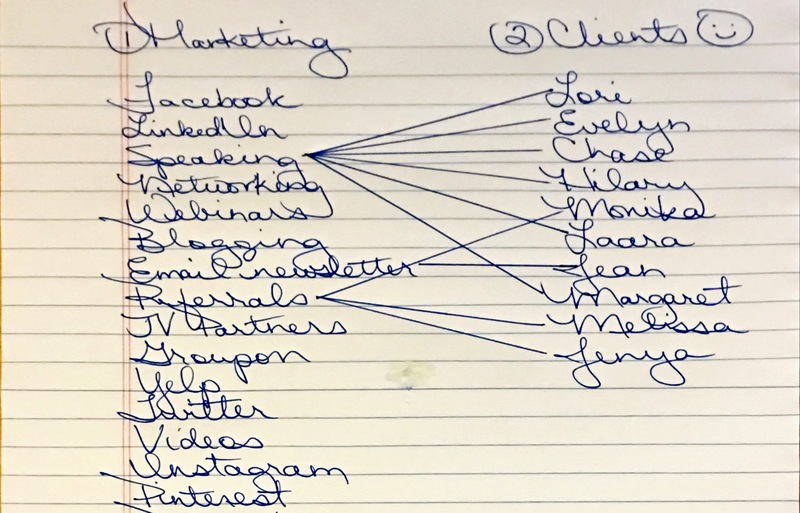 This is great for me because it gives me a visual for organizing and restructuring my marketing. It is very implementable. EXCELLENT! You hit the nail on the head. So much of the mess of marketing comes from it just being a swirling mass in your head. Getting it on paper, and prioritized let’s you take control and make smart choices so you can do less, stress less, and see more results!